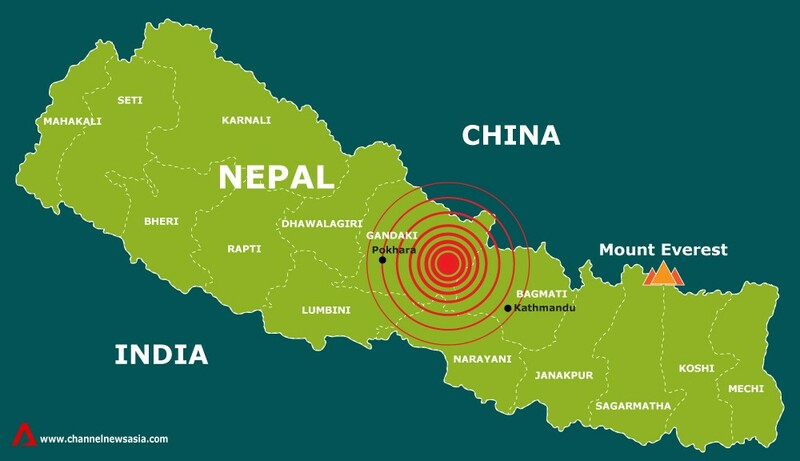 On Saturday, April 25 2015, at 11:56 am a massive 7.8 magnitude earthquake struck Nepal. It was the worst earthquake in more than 80 years. The epicentre was less than 50 miles northwest of Kathmandu, the country’s capital in central Nepal. It struck at a relatively shallow depth of 6.8 miles which contributed to its strength and resulting damage. The quake lasted about 50 seconds and was followed by hundreds of aftershocks over 4.5. Kathmandu reportedly shifted 10 ft to the south in 30 seconds. While Dan worked hard to get his guests safely out of the country, Arjun headed home to Gogane, Nuwakot district which is roughly 100 km northwest of Kathmandu. He hitched a ride, but was unable to make it to his village due to unstable roads and walked the last 20 km carrying a 40 kg pack full of first aid and plastic shelters. The epicentre was in Gorka district about 18 km west of Arjun’s village. Two major aftershocks of 6.6 and 6.8 occurred among the hundreds in the days following. 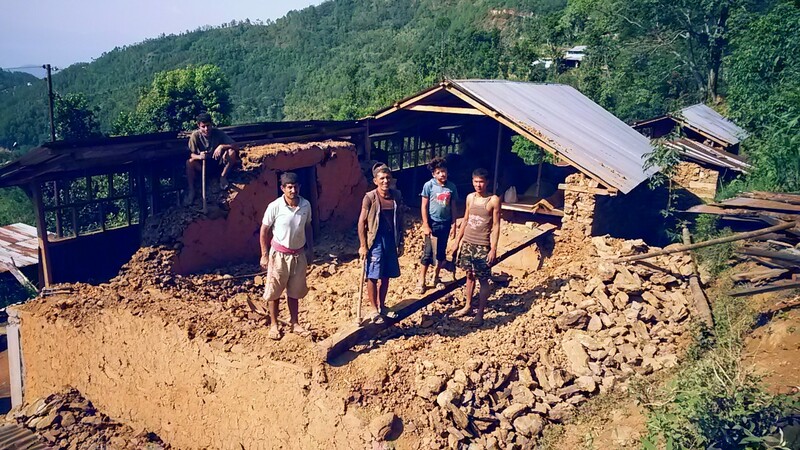 Buildings collapsed, landslides and boulders constantly tumbled down through villages meaning sleep was few and far between. 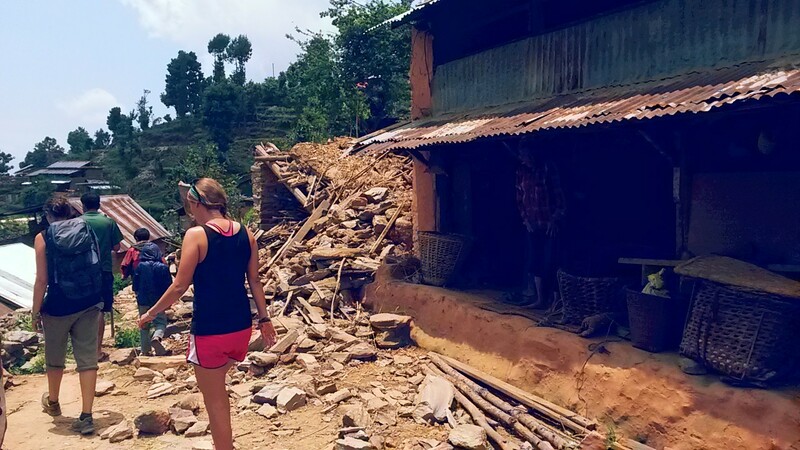 Tens of thousands of Nepalese and foreigners were also dealing with the heartache of loved ones killed or missing. Active Adventures cancelled the rest of the trekking season and almost all foreigners left Nepal. Dan decided to stay on with his brothers and assist with the survival of the folk in these hard hit villages. The initial quake killed close to 9900 people and the second about 150. Approximately 22,000 people were injured and 8 million were affected. Estimates put roughly 1.1 million children in urgent need of assistance. Tribhuvan International Airport, serving Kathmandu, quickly swelled to capacity with incoming relief and fleeing travellers overloading services. All boarding lounge exit doors were opened to the tarmac as aftershocks caused travellers, security and immigration to flee to safe zones on the runways. Few airport workers were at their posts as many were either killed in the earthquake or had to deal with the after effects. Many UNESCO World Heritage Sites were damaged or destroyed, such as the Dharahara tower, built in 1832, killing at least 180 people. A second quake of 7.3 struck 17 days later on the 12th of May. This caused further damage and suffering to those who survived the initial disaster. 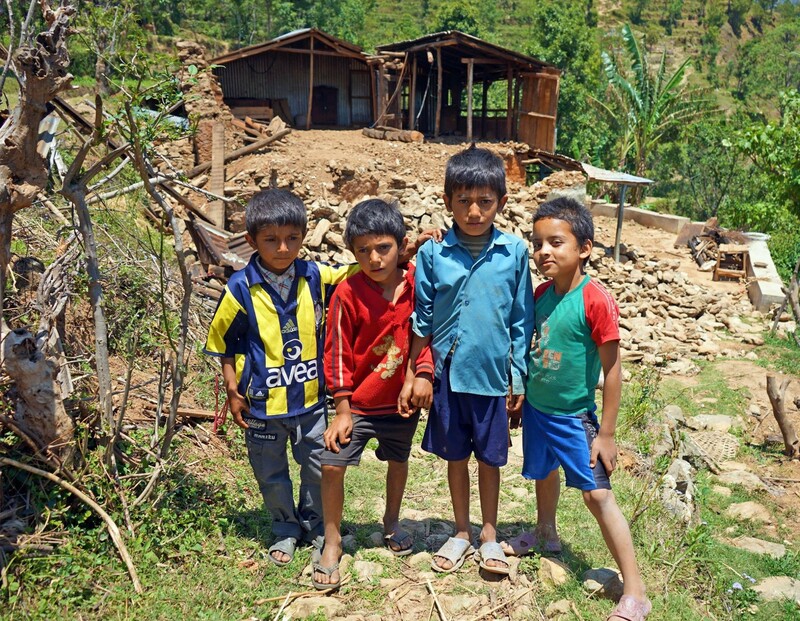 The first days after the earthquake, Arjun stayed in Gogane to build shelters out of bamboo and plastic for his extended family and neighbours as monsoon season was fast approaching. Shree returned to Kathmandu to check on his and Arjun’s wives and children. They were all afraid, but OK.
Dan’s guests had safely flown home after 3 days sleeping on the airport floor. The Active Hearts’ Satdobate library, that was due to open in 5 days on 1st May, was destroyed. 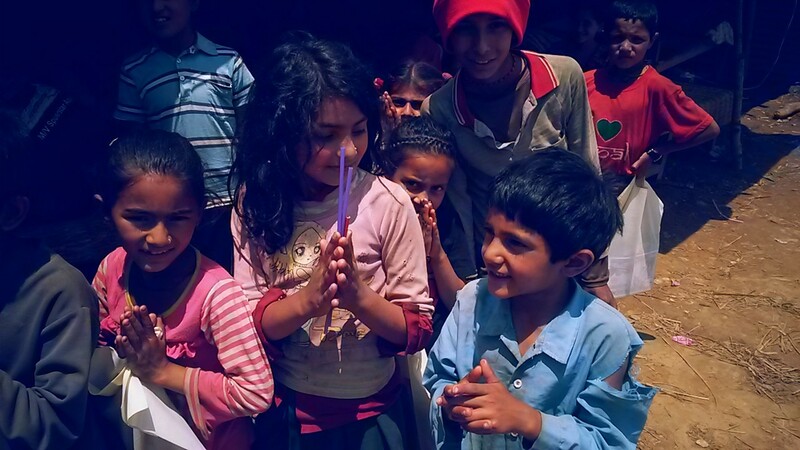 All remaining funds for this project were immediately put towards emergency supplies. Gareth Leonard, aka Tourist2Townie.com, made a fantastic video of these first few days and the adventurous trip with the first jeep load of supplies to Gogane. 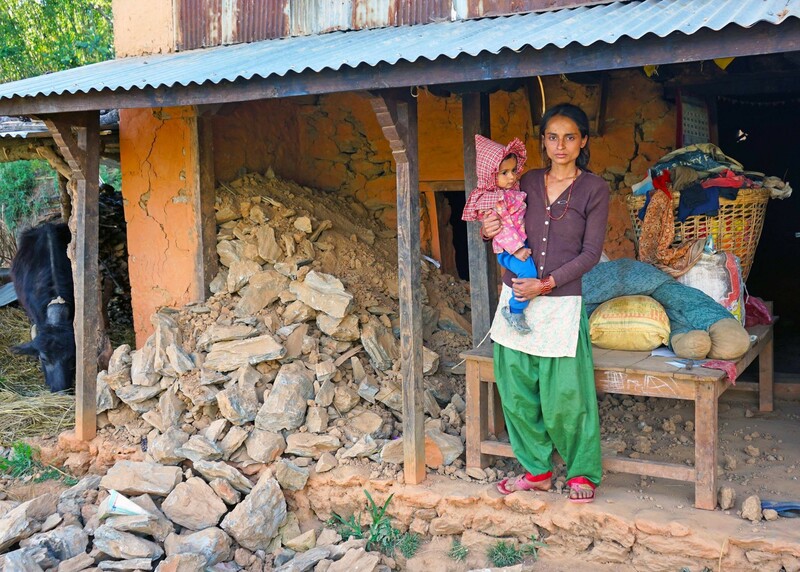 During the 6 weeks that followed Active Hearts spent roughly USD$50,000 on immediate survival supplies for rural Nepalese. As well as resources we personally delivered, Active Hearts sponsored jeeps that other friends took to hard hit areas such as Gorkha, Dhading, Kavrepalanchowk and Solu Khumbu. A donation page was set up specifically for local guides and porters so past trekking guests could easily and safely get funds sent to them through Active Hearts. Approximately USD $6000 was distributed through this page. They also assisted financially to the cremations of loved ones lost. Hundreds of flyers were given explaining the dangers of human trafficking which unfortunately blossoms during disasters such as this. 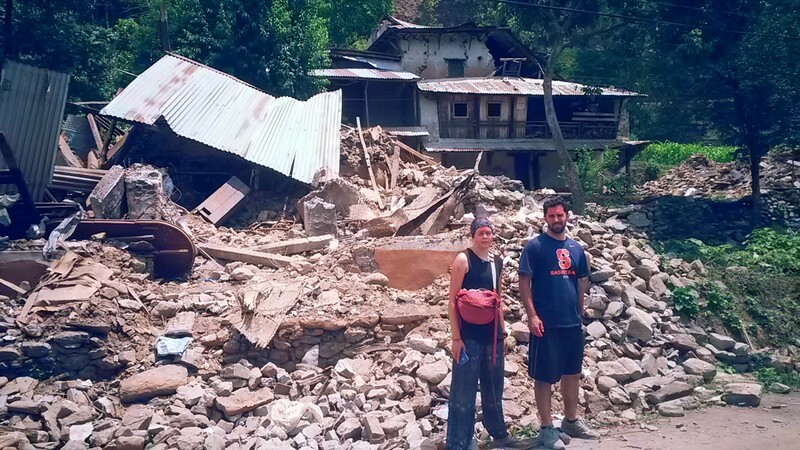 The crew sponsored a jeep load to Yellow Gompa in Kathmandu where the survivors of Langtang were given refuge. They helped to distribute sanitary products, food and water. Unfortunately, the international aid and government assistance seemed to be scarce to non existent in many areas. Active Hearts managed to provide roughly 400 shelters amongst 12 villages. These temporary accommodations could house 2500+ people. The idea was to reuse the materials for rebuilding once monsoon season had passed. In some cases we asked for a 'rebuild donation' from recipients when possible to go to the local school. After six weeks of tough, beautiful, horrible, amazing, scary and humbling times the last of the Hearts international team finally flew out of Kathmandu. It had been an experience we would never forget. Witnessing the cruel and unforgivening forces of mother nature, but also seeing the power of community and selflessness in times of tragety was incredibly sad but heart-warming. 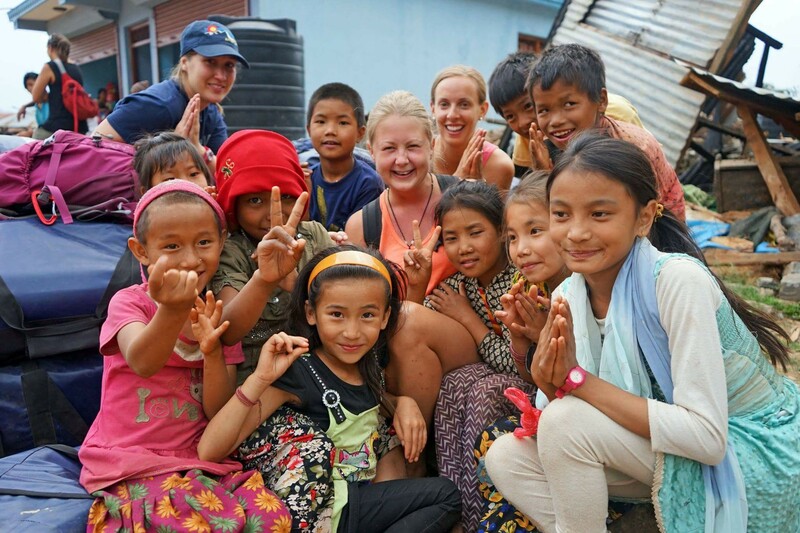 Friendships forged became the foundation for our little charity and those involved vowed to return to Nepal and help them rebuild.